So my friend gives me a couple dolls her daughter didn't want... so I ended up using them to test out a Coin Acceptor (more about that project on that page). I still had the two dolls left over that I wasn't sure what to do with, when a new thought hit me. I could take the circuitry off my Cyborg Chicken project and connect the dolls to the servos the same way they were hooked up to the Coin Acceptor. Now we can have a good ol' fashioned cat fight! A couple of my co-workers helped me film this video during lunch time (we aren't allowed to play with dolls during work hours). I filmed the first few clips and took over on the blonde in the very last clip. One of the dolls stole the other one's boyfriend... or something. 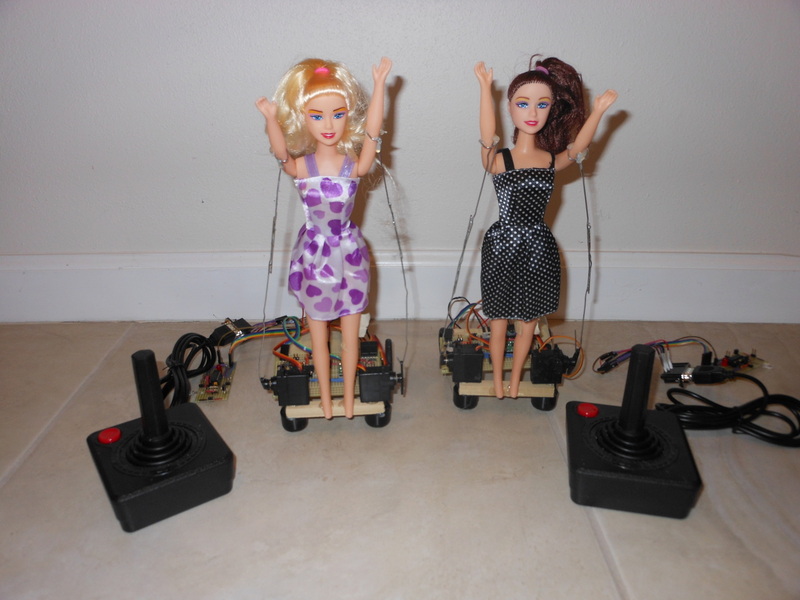 Here are the blonde and brunette dolls together along with the circuits and the Atari 2600 joysticks. I ended up having to take both the Coin Acceptor and Cyborg Chicken projects apart to work on this one. I cut 8 pieces of wood and hot glued 4 together to make a base for the project. One thing I remember from the Cyborg Chicken project was the chickens had a really hard time turning, so I decided to try some casters that Pololu sells. Other than that, I used the same motors and wheels I did before. I also used the same servos which are connected to the doll's arms by an unrolled paper clip. Actually, it's two paperclips soldered together to make them long enough for the servo to reach the arms. The firmware is pretty much unchanged except I dropped both circuits down to 8MHz using the MSP430G2231 DCO. I think this actually helped fix the circuit starup problem that I was having before.